2011 was a year that saw Bowmore increase its presence in the great outdoors. The first Islay Single Malt kicked this off with a series of experiential sampling activity which took place at five of the UK’s biggest and most popular outdoor events. The six-figure investment saw the Bowmore stand land first at Outdoor Pursuits in Edinburgh, and then travel across the UK visiting The Royal Bath and West Show, The CLA Game Fair, Southampton Boat Show and finally Kendal Mountain Festival, engaging over 450,000 target consumers in total. The stand offered guests complimentary in-depth taster sessions of Bowmore’s Single Malts with the Distillery’s experts, allowing them to learn the finer points of malt whisky. In addition to the outdoor sampling activity, Bowmore was sampled by over 10,000 people in 2011 at various whisky shows, with particular success at The Whisky Exchange Whisky Show in London where the legendary Bowmore 1964 White (RRP £2,500) was the talk of the event. 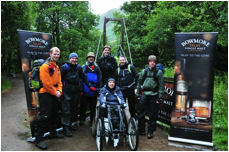 As part of its outdoors marketing drive, Bowmore sponsored the Bowmore Ben Nevis Challenge which saw eight teams of disabled and non-disabled people work together to scale the UK’s highest peak, in aid of Capability Scotland, Scotland’s best known disability organisation. Guided by ex-SAS officer and TV Presenter Ken Hames, the teams reached the summit and ended what was theculmination of months of training, preparation, not to mention, hard work and sweat to raise over £100,000 forCapability Scotland. The Morrison Bowmore team also received extra support in the form of team member Rob Allanson, Editor of Whisky Magazine, who documented his journey via the Whisky Magazine and Scotland Magazine. Bowmore entered the second year of its long-term international partnership with National Geographic magazine - the world-renowned authority on photography and the outdoors. This partnership included the sponsorship of the ‘National Geographic International Photography Contest’, a competition that invited amateur photographers to enter their photographs for the opportunity to win a trip to Islay and see their work star in a future Bowmore advertising campaign within the National Geographic Magazine. This competition was supported by regional media competitions, as well as advertisements within the National Geographic magazines that reach over 250,000 readers. To further support this activity, Bowmore partnered with renowned landscape photographer Colin Prior to create a series of Bowmore Outdoor Photography Workshops which took place at select Whisky Shops across the UK. These events promoted through a targeted PR campaign as well as by the Whisky Shop to their networks, achieving great success, with each event reaching full capacity. These complimentary workshops allowed photography and whisky fans to pick up photography hints and tips from a renowned expert before entering the competition whilst exploring some of Bowmore’s unique expressions through the whisky tasting. 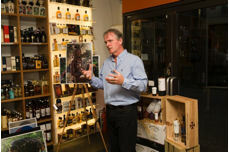 The on-trade push focused on a series of in-depth tasting sessions and food pairing evenings called ‘A Taste of Islay’. These events took place at premium accounts across the UK including the Malmaison and Hotel Du Vin group, Ronnie Scott’s, McQueen and The Park Hotel Teddington in London. Almost 800 guests paid for this tasting experience with a Bowmore expert. As a result of these highly successful events, the core range of Bowmore Single Malt is listed at all the aforementioned accounts and The Park Hotel whisky bar has since been officially branded the ‘Bowmore Whisky Bar’ featuring every Bowmore whisky from the core range as well as the Bowmore Tempest. 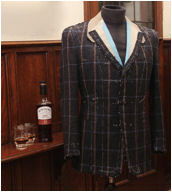 For Christmas, Bowmore created a premium gift package the Bowmore Tweed Savile Row Experience. This collaboration with Malcolm Plews, esteemed Savile Row tailor and Warrant Holder to Prince Charles, is a bespoke tailoring session where gents are fitted with a made-to-measure Bowmore Tweed jacket whilst having an in-depth one to one whisky tasting with a Bowmore expert. The tweed has been created by the Islay Woollen Mill and echoes the brand’s heritage and provenance with its colour palette - blues, burnt orange and grey. The package, which retails at £3,000, also includes first class travel to London, a night’s stay for two at the Malmaison Clerkenwell, and lunch for two at the undeniably chic Sartoria restaurant together with a bottle of Bowmore 15 Years Old ‘Darkest’ and whisky glasses. The PR push to support this activity achieved an array of coverage in national print and online media.